There wasn’t an empty parking spot to be found. The line of fans curved around the outside of the building. Teenage girls waited in the lobby, hopeful there would be a no-show and that they could nab a ticket. A rock concert? It certainly felt like it, but in this case, the setting was the Miller Library and the rock star was Chimamamda Adichie, the uber popular Nigerian-born novelist with crowds that follow her anywhere. When she walked on stage, tall and regal in her bright red outfit, she had her audience’s undivided attention for the next hour. Adichie is just one of the successful authors who has called Howard County home over the years, and her popularity here is indicative of the deep appreciation the area has for literature. That summer visit from Adichie was one of two literary events in one weekend, the second being the Books in Bloom, Maryland’s inaugural book festival, which coincided with Columbia’s 50th anniversary celebration. By most accounts, both events can trace a path back to 1972, when Ellen Conroy Kennedy moved from New York City to Columbia with her husband, Padraic. The Kennedys liked what they saw when they arrived back then. But they also made note of what they didn’t see: culture, particularly in the area of the written word. Other HoCoPoLitSo events include the annual Evening of Irish Music and Poetry, which will mark its 40th anniversary in 2018. Padraic Kennedy was its original champion, and the event attracts some of Ireland’s top writers, combining the literature with Irish music and dance. Past authors have included Colum McCann, Emma Donoghue, Frank McCourt and this past year, Belinda McKeon, whose second novel, “Tender,” was published in 2016. The original LPR folded for a time in the 1980s but a group of local writers revived it in 2006. Work in the publication has included poetry from Michael Glaser, Joy Harjo and Donald Hall, and fiction from Manil Suri, Michael Chabon and Edith Pearlman. 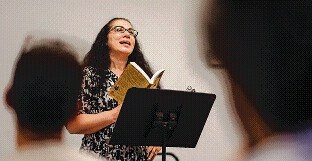 Local poet/author Ellicott City-based Laura Shovan, has served as a poet in residence in the Howard County schools for the past 15 years. “I typically work with one grade at a time and spend three to five workshops with each group,” Shovan explains. Like much of Howard County’s literary roots, Maryland’s Black-Eyed Susan awards can trace a path back to an inspired citizen’s living room. The citizen in this case was Ellicott City resident Thea Jones, and she was joined by fellow media specialists Louis Heinrich and Mary Hackman. 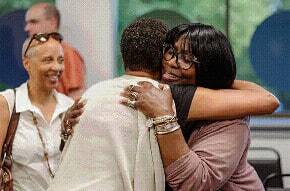 Together, the three women recognized a need and stepped in to fill it. As the original name implies, Jones and company established the awards as a way to engage youth in reading by allowing them to vote from a curated list of books each year. Books must be no more than three years old at the time of nomination and voting, and students, parents, teachers or other interested readers may suggest titles to the committee. Then the hard part: choosing the books that make the final list. Criteria for the lists include a good central idea; an appeal for the audience to which it is directed; originality of idea; good writing; and even, sure plot development; among others. Today the committee considers titles in the categories of picture books, grades four to six, six to nine, high school and graphic novels. The committee enlisted the help of school media specialists to help grow the program and today, the Black-Eyed Susans are an ingrained part of most Maryland public and private school library curriculums. “We created activities for the librarians to help engage the students and promote the program,” says Jones. Inspired by her time with these students, Shovan authored “The Last Fifth Grade,” a novel in verse that follows a fifth-grade class attempting to save its school from a threatened closing. “The book was six years in the making and is very much related to the work I do here in the county,” she says. The county figures large in her current project as well. “It’s called ‘Take Down’ and is set here, loosely based on my son’s experience as a wrestler,” she explains. 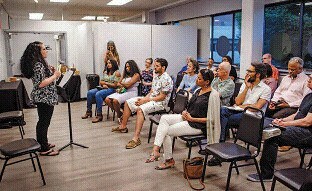 Like Kennedy before her, Shovan recognized a hole in the county’s literature scene and over the past year helped launch Wilde Readings, a combination of author reading and open mic event. 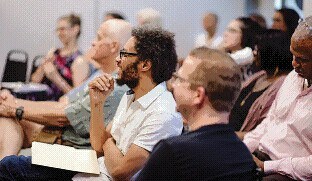 Working in conjunction with Ann Bracken, Lind Joy Burke and HoCoPoLitSo, Shovan hosted 10 events at the Columbia Arts Center. “I wanted to have something more grassroots here,” she says. The popular series is expected to return this fall. The written word has also launched a romance or two over the years. Hobby met husband/ photographer David Hobby through Patuxent Publishing Co., and authors Carrie and John Gregory Brown met there as well.